I wanted to call this one “You are my Sunshine” but the words won’t fit on the card. So I decided to call it Sunshine knowing you can just add “You are my” to the card yourself. Sunshine is a symbol of happiness, bright days and of summertime though the sun shines even in the dark of winter. Wear this to remind yourself that no matter what is happening in your life, the sun will come out again. The Pendant measures 2.9 cm across (1 1/8 in). Easy to wear, I love this necklace! I received this pendant as a welcome gift for buying another pendant. It’s Absolutely beautiful, and I’m so glad I found this online store to diffuse my favorite oils. I got this as an “extra” when I ordered my pendants, and couldn’t have been more surprised, or pleased for that matter!! This and the other pendants I ordered are just wonderful!! 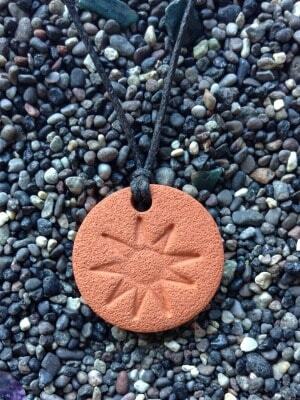 Beautiful and lightweight, this sunshine pendant allows me to wear my oils out into the sunshine every day. Thank you ‘Terra Cotta Pendants’ for an amazing (and attractive) way to diffuse oils!! !